The 7 Pack is a convenient and easy way to organize and carry your medications. 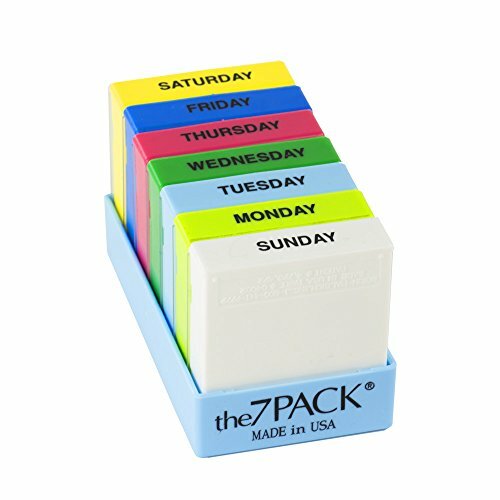 It comes with 7 color coded pill boxes labeled with each day of the week. The inside of each color coded box contains 2 separate compartments labeled for the specific time of day. (AM/PM). The brightly coded boxes and bold black letters allow for easy identification. They were also designed to fit perfectly inside a purse, or pants pocket for quick and easy travel. This system allows you to plan out a week's worth of medication, with the ability to quickly grab an individual day's dosage when on-the-go. The lids shut securely assuring they won't open and spill, but still remain easy to open when you want them to. Lastly, worried about them getting dirty and grimy in your purse or pocket? Don't be! These handy little pill organizers are also dishwasher safe, making keeping them clean completely hassle free. If you have any questions about this product by Borin-Halbich, contact us by completing and submitting the form below. If you are looking for a specif part number, please include it with your message.